When you have bought an orchid from Wooning Orchids, you are assured of a quality product. Whether you prefer rustic, classic or modern, our orchids can enhance and emphasise your own style. Wooning Orchids sells both Phalaenopsis and Dendrobium Nobile, each of which needs different care. To keep these splendid eye-catchers looking beautiful in your home, we have a number of tips for you. Put the Phalaenopsis in a light place, but never position the plant in the direct sunlight. The ideal temperature is between 18 and 22ºC. In summer, watering every 5 to 7 days is sufficient, but in winter once every 7 to 10 days is adequate. The best way of watering it is to immerse the plant in tepid (tap) water. Let the plant stand in the water for 10 to 15 minutes and then let it drip well. Never let leaked water stand in the outer pot. The Phalaenopsis needs special orchid nutrients once a month. You can halve the quantity in winter. They are soluble in water. Re-pot the plant if it becomes too big for the pot, or if your orchid has finished flowering and no longer produces flower stems. Take the plant out of the pot carefully, ensuring that the roots are not damaged. Phalaenopsis likes an airy mixture of tree-bark and peat or coconut pieces. So never use normal potting soil. To get the Phalaenopsis to flower again, it is necessary to prune the stem above the second or third ‘eye’ from below. The orchid may then flower again after four to six months. After pruning place the orchid in a slightly cooler place. The ‘cooling’ stimulates the growth of new sprigs. After about two months you can return the orchid to its former position. After pruning, give the Phalaenopsis a little less water. Once the orchid has been relocated to its former position after about two months, you may recommence normal watering. Dendrobium Nobile tolerates a lot of light, but never place it in direct sunlight in the spring and summer. This plant prefers a cool, airy environment. The ideal temperature is between 15 and 20ºC. Just like other orchids, the Dendrobium Nobile may not be left too wet, but certainly also not dry. Watering every five days in summer is sufficient, while once every seven days is fine in winter. The best way of watering it is to immerse the plant in tepid tap water. Let the plant stand for a while in the water and then let it drip well. When in full bloom, the Nobile requires special orchid nutrients once every two weeks. You can halve the quantity in winter. They are soluble in water. Once the flower stem has finished blooming, the flowers will fall off of their own accord. 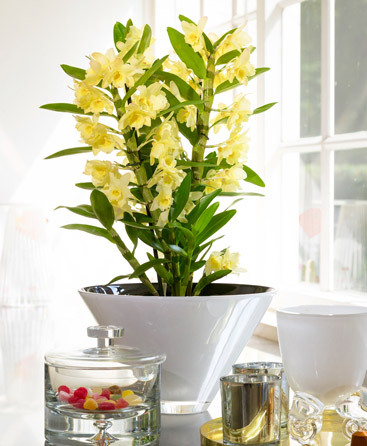 Place the Dendrobium Nobile in a light place where the temperature in winter is between 10 and 15ºC. Simply water the Dendrobium Nobile as usual in this period, in other words don’t let it dry out. From a new shoot the orchid will again produce new flowers. As a rule this takes between eight and twelve months. The Dendrobium Nobile does not flourish well in an over-large pot, and can even remain in the same pot for two to three years. Re-potting is thus only necessary if the Dendrobium Nobile really doesn’t fit in the original pot any longer. Go to www.orchidsinfo.eu for more care tips, styling ideas and new varieties.